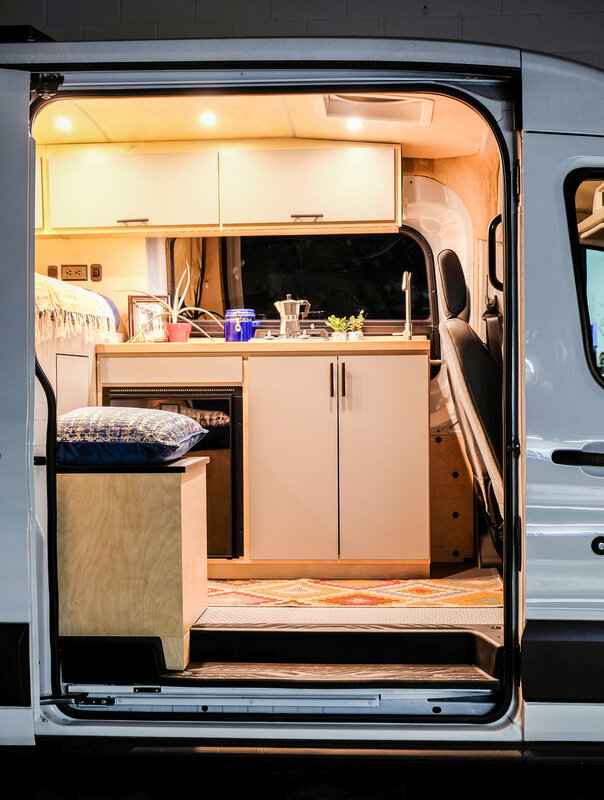 Vincent Van-Go, the 148" Medium Roof Ford Transit, was designed to be the ultimate home base during long mountain biking adventures. The Baltic Birch walls and ceilings keep this tiny home on wheels feeling light and airy. The fog colored formica cabinetry was chosen so that all scuff marks and muddy paw prints are a breeze to wipe off. Two Maxxair 7500k MaxxFans were installed in the ceiling, and CR Laurence t-vent windows were installed in both the sliding door and behind the kitchenette. We wanted to ensure maximum airflow for a couple of lucky dogs (literally) that get to call this place their second home. Efficiency is the name of the game in all of our designs. This compact kitchenette unit includes a double burner cooktop, stainless steel sink with a removable cover that doubles as a cutting board, a grey water system and electric water pump and an Isotherm Cruise 85 Elegance AC/DC refrigerator. Tiny spaces require some outside of the box (or inside the box) design. This storage bench houses a cassette toilet. All of the cabinetry is designed in-house and custom cut with a CNC router. All drawers are outfitted with heavy duty touch-to-open Accuride slides. No matter the turn, these drawers stay closed until you want them to open. Blum Aventos lift arms are installed on all upper cabinets. We used RockyMounts Driveshaft thru axle bike mounts to keep all three of Virginia's mountain bikes secure when she's not on the trail. An on-demand heated shower was mounted on the back door so that all humans, dogs, and bikes can get squeaky clean at the end of a long day. Safe travels Virginia, Sebastian, and Georgia!